Stewart L, Clarke M, Rovers M, Riley RD et al. Preferred Reporting Items for a Systematic Review and Meta-analysis of Individual Participant Data. The PRISMA-IPD statement. JAMA. 2015;313(16):1657-1665. Meta-analysis methods in systematic reviews combine the quantitative evidence across related studies to produce results based on a whole body of research, and as such they are an integral part of evidence-based medicine. Traditional methods for meta-analysis synthesise aggregate data (summary data) obtained from study publications or study authors, such as a treatment effect estimate (e.g. an odds ratio) and its associated uncertainty (e.g. a standard error or confidence interval). An alternative and increasingly popular approach is the meta-analysis of individual participant data (IPD), or individual patient data, where the raw individual-level data are obtained for each study and used for synthesis. IPD is now more frequently provided by study authors for meta-analysis and IPD systematic reviews are gaining popularity. However, guidance is needed on how to conduct and report this new, evolving type evidence. In this article, the original PRISMA statement, which refers to reporting traditional systematic reviews and meta-analyses, is extended to provide guidelines for how to report a systematic review and meta-analysis that use IPD. These include crucial additions in regard how the IPD was obtained, checked and analysed, and how studies not providing IPD were incorporated (if at all). The guidelines should improve the transparency and impact of IPD meta-analyses in the future. For those interested in knowing more about IPD meta-analysis, Professor Riley is running a training course on "An Introduction to Statistical Methods for IPD Meta-Analysis" on 2nd and 3rd December at Keele University. Please email Richard for further information. Over 3,500 physiotherapists attended the congress from around the world and Keele researchers played a significant role - Annette Bishop represented the UK in a debate about direct access to physiotherapy, Jackie Waterfield presented her qualitative research on physiotherapists’ training needs for support pregnant women with back pain and Nadine Foster and Jonathan Hill chaired and presented a symposium on matching back pain patients to the most appropriate treatments. Two out of three pregnant women have lower back pain but few receive any treatment, explained Jackie Waterfield. The Ease Back (evaluating acupuncture and standard care for pregnant women with back pain) project has found that many physiotherapists are reluctant to use acupuncture in pregnancy, even though it has been shown to be helpful. Some are deterred by a culture of caution, especially around inducing early labour and the risk of litigation. Annette Bishop participated in a panel discussion on direct access and self-referral, which provided audience members with different international perspectives on direct access to physiotherapy. Panellists concluded that multiple factors influence the route to direct access including legislation to allow physiotherapists to work as first contact practitioners, support from professional bodies, physician colleagues and patients and a robust evidence base. Annette also presented results from a pilot and feasibility trial being conducted here at Keele into direct access to physiotherapy, which is contributing to building the evidence base. 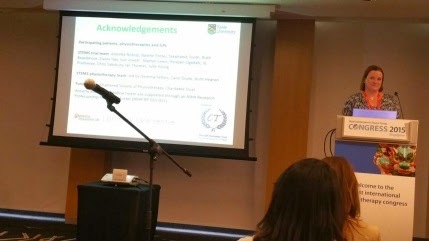 Professor Nadine Foster convened a symposium on stratified care for lower back pain with an international panel that also included Jonathan Hill. Stratified care categorises patients into groups on the basis of characteristics such as underlying mechanisms or likely response and fast-tracks them to the treatment that’s most likely to work for them. Different approaches developed in the UK, Australia and the US all look promising. Panellists warned of challenges ahead to ensure that future care is based on good evidence and to avoid confusion in clinical practice. 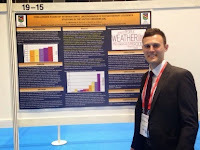 Two posters were presented at WCPT congress from SHAR and were very well received by a host of international higher education institute representatives. The posters focussed on Multiple Mini Interviews (MMI) for undergraduate physiotherapy entry in the United Kingdom (UK), as well as Challenges faced by international undergraduate physiotherapy students studying in the UK. Adam Winterton, Teaching Fellow in physiotherapy, represented SHAR at the event. 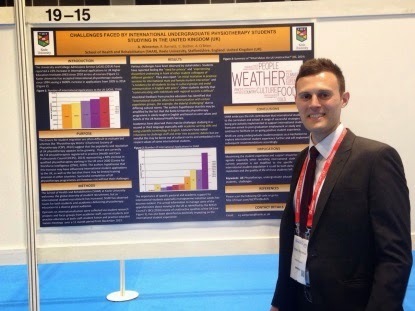 Four of the 9 attendees were successful in winning £1,000 Robert Williams awards from the Chartered Society of Physiotherapy (CSP) enabling them to present their research in Singapore. 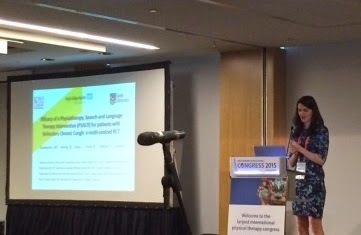 Sarah Chamberlain spoke about an intervention for patients with chronic cough, using physiotherapy and speech and language therapy. Kirsty Duncan described the redevelopment of a scale measuring healthcare practitioners’ attitudes and beliefs about musculoskeletal pain. 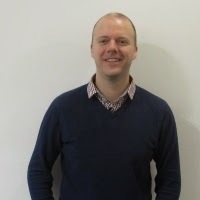 Jonathan Quicke presented work examining the relationship between attitudes, beliefs and physical activity in older people with knee osteoarthritis.